Have you ever wished for a magic wand? I know that I have, especially when contemplating a new writing project for my coursework at Walden University. I’d love to wave a magic wand and magically become a more skilled writer before my next paper is due! 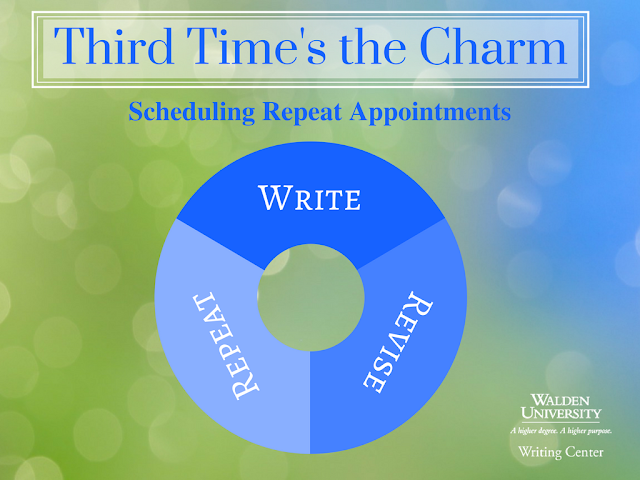 Make at least three paper review appointments at the Walden University Writing Center this term. While it may seem common sense that three appointments would be better than one or zero, some compelling research supports the argument for making at least three paper review appointments at the Writing Center to review your writing. While many researchers have discussed the overall efficacy of Writing Center visits in improving student writing (Learner, 2014; Robinson, 2009; Yeats, Reddy, Wheeler, Senior, & Murray, 2013), Irvin (2014) found that when students attended at least three writing tutoring sessions, success factors like persistence and grades improved. In addition, Williams, Takaku, and Bauman (2006) used a longitudinal study to conclude that only the frequency of writing center visits predicted grade outcomes for students. Finally, Robinson (as cited in Irvin, 2014) discovered that three tutoring sessions can help students shift their motivations for improving their writing from extrinsic to intrinsic, and increasing intrinsic motivation can improve overall learning. Taken together, this research points to the third time being the charm when making Writing Center paper review appointments. Multiple appointments allow for more breadth in reviews, and they also allow you to gain the perspective of a critical reader outside of the classroom. Writing instructors can help you pinpoint areas where readers might be confused and provide writing and revision strategies you can use in future papers. Some students prefer to work with one instructor over multiple appointments, while other students prefer to work with a different instructor for each appointment. You can listen in on the debate about continuity versus variety in writing feedback on WriteCast podcast episode 32. However, whether you choose to work with one writing instructor or many, all of our instructors are interested in helping you make the transition to a successful scholar practitioner. Although using the Writing Center can help you work toward your writing goals, three appointments at the Writing Center will not magically improve your grades and writing. Three visits is a great start, but continuing to visit can help to improve your writing skills over time. Learning revision and self-editing skills involves hard work and effort, and our paper review appointments provide a way to focus your efforts to improve your writing rather than a shortcut to better grades. With that said, why not make it a goal to schedule and complete at least three appointments at the Writing Center this term? The staff and writing resources at the Writing Center are here to help you set and achieve your goals! I encourage you to make an appointment at the Writing Center today, even if you don’t have any papers due right now. Remember that writing instructors can also review past work to help you with future assignments. Because writing instructors generally comment on patterns within writing, you’ll be able to use the tips and techniques in your review for future assignments as well as current assignments. If you’re unfamiliar with the Walden University Writing Center’s paper review service, you may want to stop by our website to learn a little more about our paper review policies and view samples of writing instructor feedback. You can also send any questions about our paper review service to writingsupport@waldenu.edu, and we will answer your inquiry within 24 hours. As a final note, I've included references for the above research at the end of this post, so please feel free to peruse it and let us know what you think. We’d love to see any other resources you’ve found about the efficacy of writing center resources. Alternatively, share your experience with using Writing Center services—have you found that the third time is the charm when it comes to making appointments at the Writing Center? Let us know in the comments! 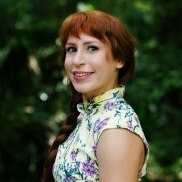 Katherine McKinney is a writing instructor in the Walden University Writing Center. She received an M.A. in English from Valdosta State University in Valdosta, Georgia, and is currently pursuing a Ph.D. in Education at Walden. Katherine's goal as an instructor is to show students that the best writing results from practice, and she aims to provide feedback and resources that will guide students through the invention, composition, and revision process.